I’ve been singing the praises of open shelving for years. 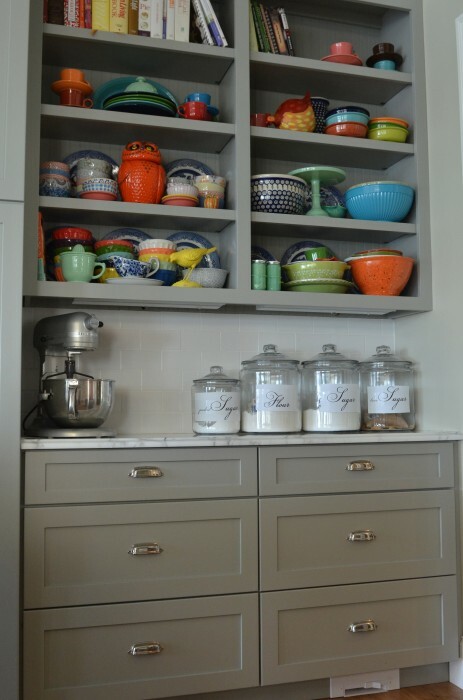 When I remodeled my first kitchen and painted my lower cabinets turquoise, I took off upper doors to give my kitchen the look of open shelving, without having to start from scratch. Then, I remodeled the original lake kitchen and added a plethora of open shelves. But with our rebuild after the fire, I took open shelving to all new level. There are open shelves everywhere. They allow a lot of your personality to come through, or so I was told by a few folks from the Better Homes and Gardens photo shoot. and Sara’s kitchen, from August Fields, who took her inspiration from Sally Wheat’s kitchen. When I got home from girl’s weekend, I was inspired to rearrange/redecorate my cupboards. In other words, they needed to be cleaned. But merely cleaning them doesn’t inspire me, so I need to turn the project into an all-day dust fest—kinda like switching out your winter clothes for summer ones, only with dishes, instead of clothes. 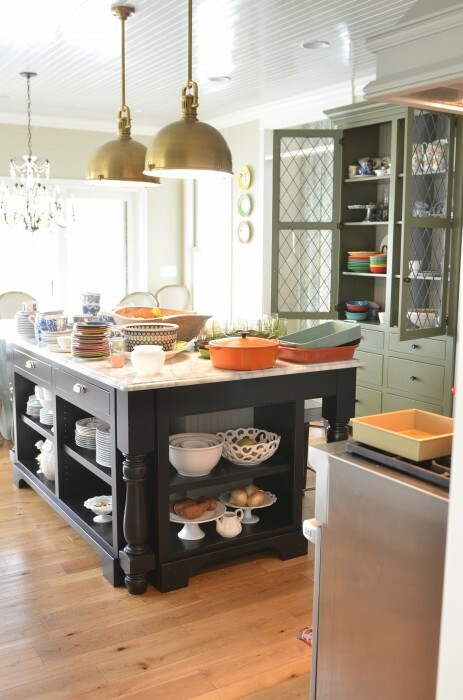 I wanted to move all the white dishes from the green hutch into the island and vice versa. Because clearly, white is spring-like. And as much as I love every pattern of color of dishes ever made (almost), I adore white dishes the most. Turns out, I’m not sure an open island is that practical. But I love not having to open and close cabinet doors 8,000 times a day. I LOVE my green hutch with its leaded glass doors. (The one I copied the design from Polly’s house.) It’s the perfect blend of open-ish but closed cabinets. Since we moved in eighteen months ago, I’ve had all my white dishes in this cabinet, while the blue and white dishes were in the black island. So, it was a fun change to switch them all out and clean as I went along. 1. In general, more open shelving makes the room look and feel bigger. This is especially true if your cabinets are dark. 2. Open upper shelves has a very European/industrial feel to it and adds an element of design that is both functional and interesting. 3. I LOVE being able to see what I have and easily get to it without the constant opening and closing of doors. It’s probably the ADD in me but fewer steps is better in my world. 4. I will always have some open shelves. I LOVE them. Truly, I do. And most of the dishes on my open shelves don’t get dusty because we’re home 24/7 and use them all the time. 1. Open lower shelving should be used sparingly, in my humble opinion. All the dust floating in the air will land on the lower open shelves and threaten to drive you to the brink of insanity. For some of us, it’s a short ride. 2. Some people don’t like the visual clutter that open shelving can create. What you might call clutter, I call art. So, know thyself. 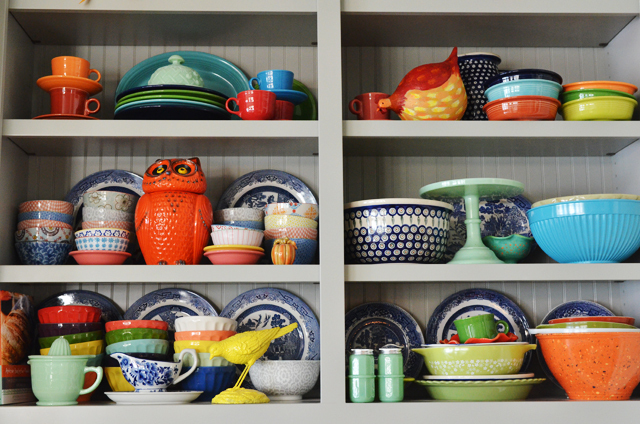 If stacks of bowls and pretty dishes are not your idea of art on display, then you might not want open shelves. As for me, I’m pretty happy with the all the open shelves. And it’s a good thing, because I’ve got lots of them!! What about you? Do you hate them/love them? Would you incorporate them into your next kitchen? Would this many of them drive you crazy? Follow lifeingrace on Facebook! or Twitter! 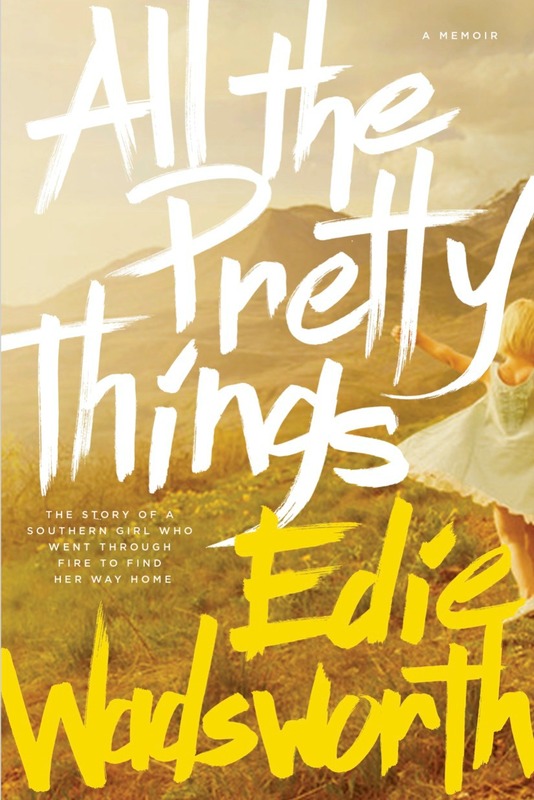 Well, Edie, I am just certain we were milling around gabbing in heaven when the Lord was passing out interests-likes-loves and we just moved along together to the white dishes-blue/white dishes-black island love-and open shelves group. I have just painted all my cabinets, and left the newly painted black island doorless. I love it, but agree, it gets dusty. You newest kitchen it my fav, although I do love the turquoise cabinets. While painting my cabinets, and having the doors off, I realized how many times a day I open those doors. It was very tempting to leave them off. But, they are back on, and my kitchen looks neater. If I were building a new home, I believe open shelves would grace my kitchen! I love your ‘milling around heaven’ analogy, Teresa!! 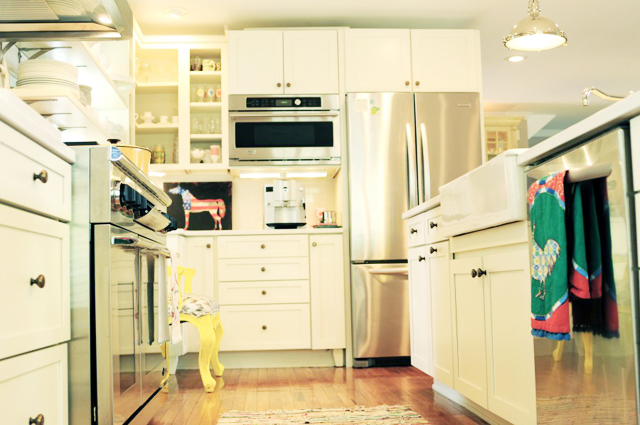 Have you blogged about your kitchen? Post a link for us! I love the way your kitchen looks, I think the lovely, colorful plates, bowls and mugs are most definitely art. The thought of taking the doors off of my cupboards frightens me. I think maybe if I had more space or maybe a pantry it would not be such a scary thought. It sort of makes me feel my underwear was showing…..even though I have tried to be organized behind closed doors, nothing in there could be considered art 😉 So I will just enjoy pictures of your wonderful kitchen and those of other organized people. p.s. where do you keep really ugly things like tupperware ? I adore your kitchen and all of your dishes! We redid our kitchen with a ridiculously low budget (like almost none), but it’s functional and a far cry better than it was. I am happy. I remember your kitchen reno and it’s fabulous!! I had to click back over to see it again. I live in a 100 year old house with a pantry – dishes are on the pantry shelves, and food’s in the closed cupboards. Who wants to look at cans of tuna anyway? And I love to see the plates and bowls looking all purty and artsy. Love your home! Glass doors are the perfect solution for me. I can see all my Polish pottery, blue-and-white dishes, and other art (loved your analogy!) I’ve collected with no fear of dust. Oh the havoc my littles would wreak upon your island shelving! Soon there would be nothing there to dust. I’m one of those that will never get over babies and therefore keep my open shelving up high. It forces me to keep clutter out and only buy things that I love to look at. A quirky cookie jar or pretty monogrammed mug goes a long way in cheering up the monotony of kitchen clean-up. I’m really glad you wrote this! I pinned your island, thinking how fabulous it would be for kids unloading the dishwasher, but wondered about the dust issue. I’m thinking now that open lower shelving wouldn’t be for me after all. So, thanks! Yes, it is very good for that, Tracy, which is one of the reasons why I won’t go to the trouble to enclose it. I love so many things about it. You are so good, Edie! Dust and dog hair flies around constantly in my kitchen, then seems to get good and glued down with grease from cooking dinner! Lovely! Question: Please tell how you turned on those great Ikea bookshelf lights in your Turquoise kitchen! I had the IKEA lights all connected to an extension cord, which ran down behind the corner cabinet and plugged in just above the lower cabinets. It was a little bit Sanford Son and a little bit rock ‘n roll. Love it! That is a concept I can get behind! While I do LOVE the look of your colourful bowls on open shelves, I’m afraid I would have a great deal of trouble keeping dust out, so thanks for the heads up on that! We are about 3-5 years out from a kitchen reno on our 20 year old house (original kitchen) so I’m just fact-gathering at this time. I love your open shelving!! The way you store all your bowls, cups, plates, etc. is so pretty and truly looks like art. I’m wondering if I did the same would it look as pretty or like clutter. I.have been contemplating open shelving. For now we’ll leave things as is while I am waiting to see what our future holds. We do have one smaller stand alone cabinet that is all open, there is always dust and dog hair but we use everything so frequently that it doesn’t settle on the dishes. Hi Edie! I am so excited to be a new follower. Although I live far away (in Iowa) I know your step-son’s Mal& Marcus well. In fact, my high school bestie married Mal! &my sister Jess spent a summer with you in Tennessee with Mal many years ago. 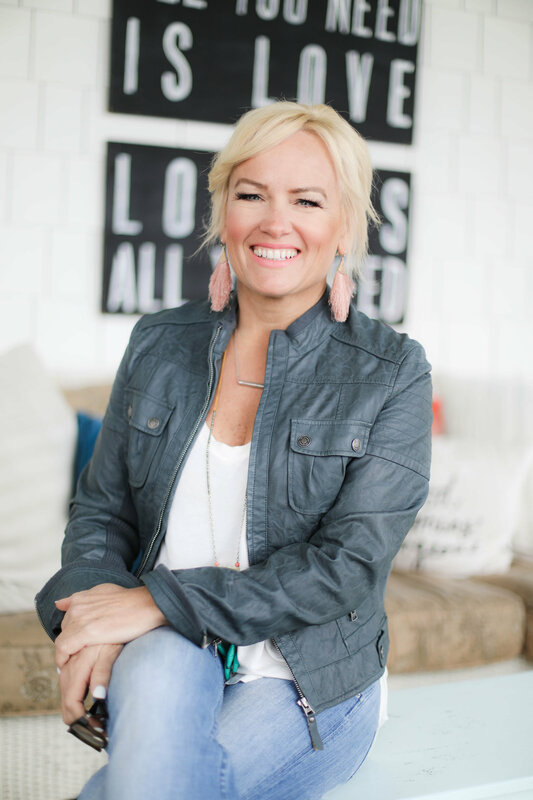 I had no clue you were in the blogging world& I am thrilled to say hello! I absolutely adore open shelving and have begged my husband to add a couple of floor to ceiling shelves in my daughters new room before we move her in. He’s slowly coming around to the idea of more work, lol! 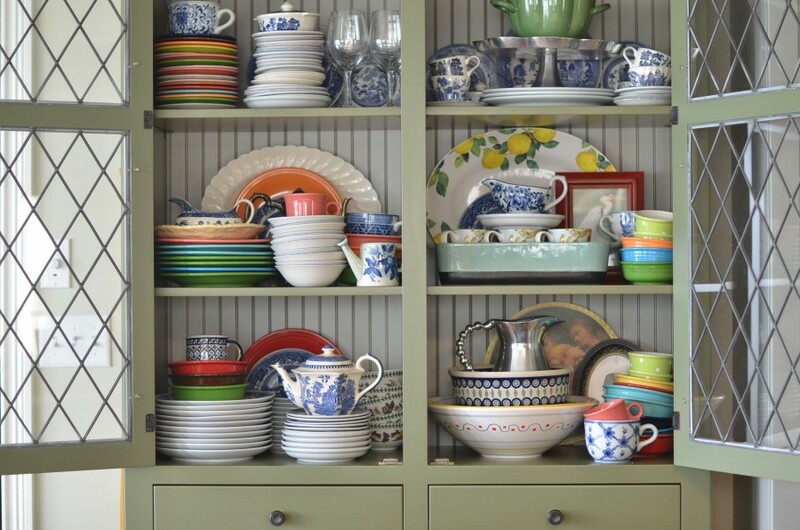 I love the idea of open shelving if I had the amazing assortment of colorful dishes you have!! Yours really does look like art, it’s amazing! We are covered in the pollen cloud right now too and I can imagine the dust in the lower cabinets would drive me batty. Some uppers would be awesome though! 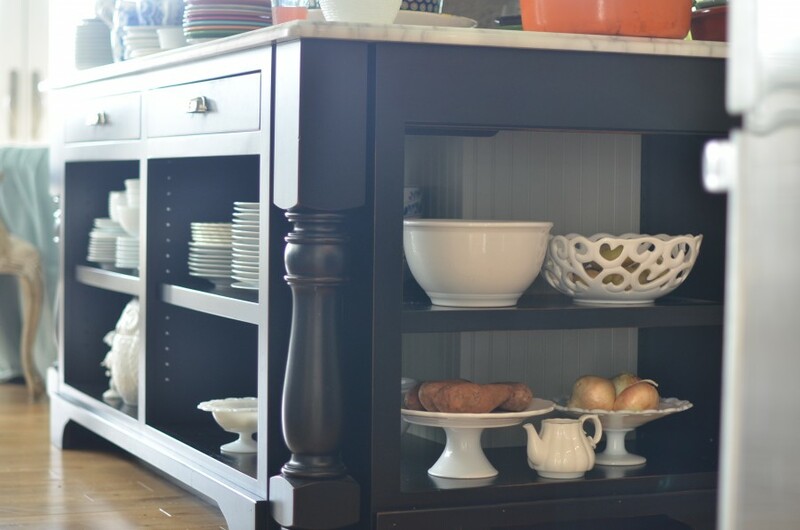 We are getting ready to do a full renovation of our kitchen, and open shelving is at the top of my list! 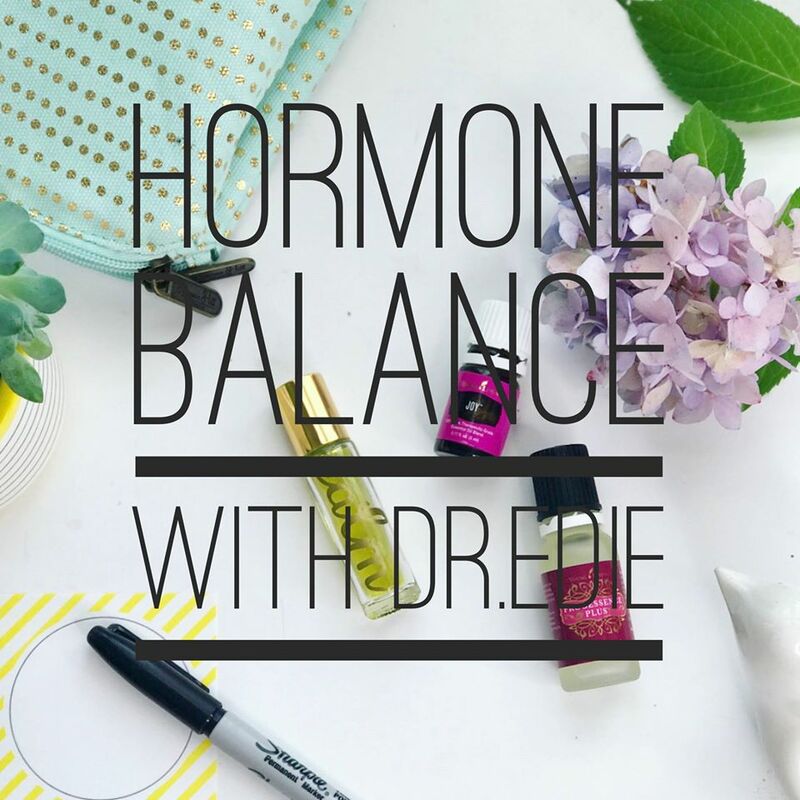 I love it for everyday ease, but I also love it for another reason; guests! We have tons of houseguests and friends visiting frequently and I want them to feel comfortable and relaxed; even helpful! Open shelving (mixed with glass front cabinetry and some closed) allows even first time visitors to walk in, grab a cup of coffee or glass of water and feel right at home. I hope this doesn’t come across as harsh. Open shelving is a hot-button issue with me. 😉 8 months ago my little family moved in with my parents while we sorted out a move, sale of home, building of a new home. We came from a house with closed cupboards where I could get away with cleaning them out every other year or so. My dear parents have open shelving and it has been all kinds of challenging with a toddler and small children. I love you Edie, but I hate, loathe, despise and abominate (name that movie!) open shelving. 🙂 The often used dishes don’t get dusty, but the rest get horrifically dusty and grimy. The shelves, especially the lowers (as you noted) get extremely dirty and dusty and the thorough cleaning out that is necessary thrice a year (at minimum) is exhausting. It can be pretty, but I think for a very young family in the country and with a dog it is impractical and gross. Please don’t hate me! Oh yes!!! “Hate, loathe, despise, and abominate ” don’t even begin to describe my feelings about open shelving in a kitchen . I had it for over 30 years and couldn’t wait to save the money for custom cabinets with flush-mount doors and drawers that were totally smooth (no decorative edges or insets to collect dust). My kitchen looks much larger and streamlined. When renovating my new/old 100 year old house , we updated my kitchen with a new backsplash, countertop and wide planked floors. We removed the doors from the original cabinets and did the open shelving design. One side is an pantry so I try to arrange my Goya cans and oatmeal box in a fashionable juxtaposition. On the other side I have my mugs , everyday dishes and bowls also organized in a kind of symmetry, however, using these items everyday puts things out of place and lets all my guests see my true self. I love the idea of open shelves. At first, I resisted it because I thought I would hate the clutter staring back at me. Then…after your posts about the open shelves, especially on your drink buffet area. My realization that I hate shutting cabinet doors and leave them open all the time because I think they are bothersome to shut when I need to get into them again in a moment. I took one door off by the sink. And I LOVE it. So I see doors coming off and paint going on while I wait for a true kitchen remodel. In the meantime I am want to do what I can to add touches of what I love where I can. Thanks for the inspiration!! love it … Sparingly! I was inspired by you to rip off a few of my cabinet doors so I could enjoy all of my colorful fiestaware!!! & I LOVE it!!!!! Hi Edie. I love your kitchen and your spring look. You are the best home-maker! What a fabulous kitchen! I lived with doorless cabinets for about 18 months until I could order new ones (in a fit of rage over the old, wonky doors, I ripped them all off in Hulk-like fashion). I loved the open feeling and loved the ease of getting to my stuff. I also loved seeing the black and white damask “wallpaper” (read:wrapping paper) I applied to the backs of the upper cabinets. I did not, however, love the west Texas dust that settled on EVERYTHING, especially the lower cabinets. It could drive a girl to drinking. So, like drinking, open shelving in moderation is my mantra. And to be clear, I live in west Texas, not West, Texas. Love and prayers for our neighbors down the road. I love them. I had them in my last home but just a few. I got the idea from Martha Stewarts off white kitchen. Yes they got dusty…but it was worth it. I doubt I could handle having as many as you though….I’m just too lazy and the dust on the lower shelves would just remind me of my short comings. 😉 I love your kitchen Edie, one of these days I’m going to show up on your door step so I can get a looksee IRL. Your open shelves make me smile though I admit I wondered about the lower island ones and the dust. Got thing you don’t have a dog that sheds ALL the time! I do love the look of open shelves or at least glass doors in the kitchen. However, I have never had them except for a decorative one or 2. Military quarters and rented apartments in Asia don’t have them so I didn’t. I don’t actually think I would like them for all my dishes because I really hate dust. Comes from living in the Gobi desert dust storm path for over a decade. I do love the glass doors to the built-in china cabinets for my china and crystal in our 200 year old farm house. I do love the open shelves in our LR for our many books. I absolutely LOVE open shelving. Ever since taking off the doors of a bank of cabs during our kitchen revamp Im a complete convert. I wish I could have ripped them out and replaced them with true open shelves, but that wasn’t a structural possibility for us at the time. Every home I ever live in from here on out will have open shelving in the kitchen. I even like the look of no upper cabinetry at all and only having lower cabinets supplemented with upper shelves. I agree that lower shelving can be tricky. Thanks so much for sharing this. Love the look of open shelving but just wouldn’t want it in my home. I hate dusty surfaces and barely have time to dust as it is and I know it would drive me batty. I think glass paneled cabinet doors are a nice alternative. I love everyone else’s open shelving, but I think I would go crazy if everything weren’t perfectly lined up. Plus my modge podge of dishes wouldn’t look great like that. So if I did go with open shelving, it would only be for a few cabinets. I’ve never had a kitchen with open shelving but think I would love it! I feel like I am opening and closing cabinets 100 times a day and don’t think dust would be an issue with how fast we go through dishes. Thanks for the great overview of the pros and cons. All of your kitchen shelves are beautiful! When I grow up, I’m FLAT OUT copying your beverage bar. Nuff said. I love the look, but I know I couldn’t live with it. Besides having to constantly rearrange and dust, there are too many little hands to mess. So for now, I’ll enjoy all your lovely pictures. Crazy, I tell you, Edie. Open cabinets would shove me over the edge on which I teeter. I LOVE them in your house. However, I have 2 dogs, 2 cats, 1 guinea pig (rest the other’s little soul), 2 hermit crabs, 2 kids and 2 parents. And my husband is in charge of floors. So…dust…we got plenty. I think of it as building our immune system. You know, there are studies that show barn dust helps your immune system – I think of my urban home as a barn. But I digress…Open cabinets = more of the clutter and filth that I try to balance fighting and embracing. But mostly fight. 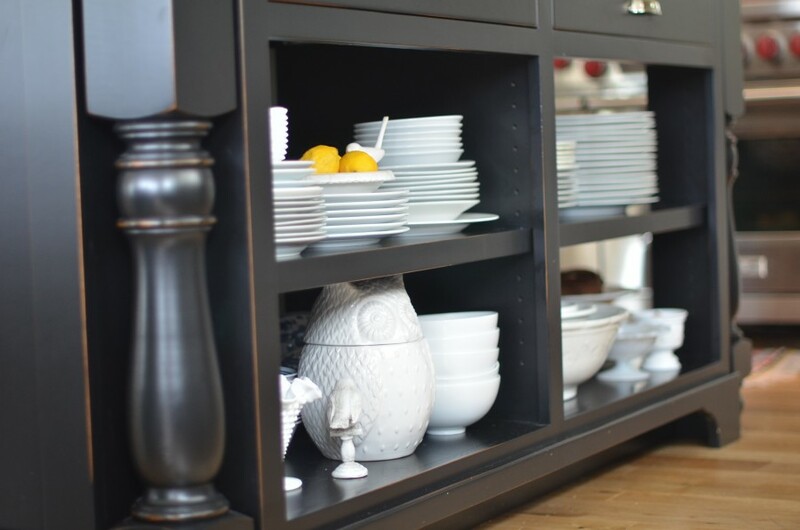 At my last house, I had one long shelf in my kitchen – that was built in the ’20s…chunky, sturdy and full of character. I put my most used dishes on it and I loved it. Everyone loved it. In that house I was single, with no animals. Loved the open shelf. That season of my life is long gone. So, closed shelves for now. Very closed. Big doors. Lots of doors. We have 3 Pomeranians and 1 Miniature Pinscher. The Poms’ long hair and their undercoat which is short, very soft and almost fuzz-like is driving me crazy (short trip) AND WE HAVE NO OPEN SHELVING! We have hair on our clothes (which doesn’t bother him in the least) all our furniture, desks, our “espresso colored” 7-piece bedroom set (which if you don’t dust daily, it looks horrible), our comforter, sheets, pillowcases, towels, bath cloths, our electronics, TVs, I think you get my drift! As you can see, I’m a basketcase now and have become obsessed with brushing them daily WHEN I FOUND A HAIR ON THE CATSUP BOTTLE IN THE FRIDGE! I love them dearly but if I don’t get some intercession, I’m afraid y’all are gonna find me at the “funny farm”! Any suggestions would be immensely appreciated! You might start using a lint roller on your pets instead of brushing them. It’s a very tidy process & our cat seems to really love it! 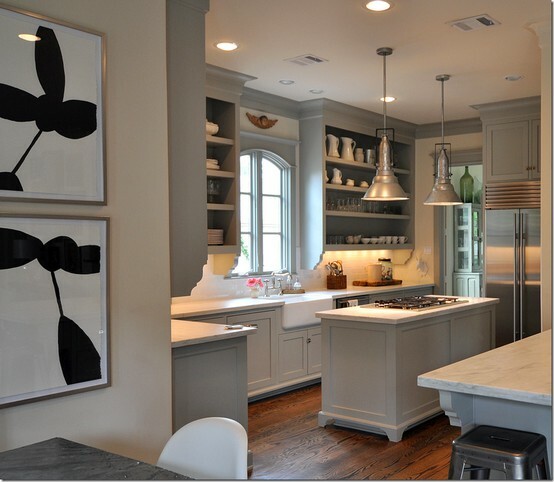 our styles differ, my kitchen has a modern esthetic but I love you kitchen. I, too, have open shelves- a large restaurant-style chrome rack and an open shelf island. I keep plates and mugs on the top, short shelf (again similar to a restaurant style kitchen) and other daily dishes on the 2nd taller shelf. On the bottom shelf, closest to the dust stirring up, I have 2 large baskets for storing unsightly necessities like pyrex storage dishes and their accompanying lids, blender jars and food processor blades. The baskets keep the dust out and hide the clutter of such items. I can understand the frustration of the dust- I have to keep up with dust on the shelves but because the dishes are up higher and used daily, they don’t require extra maintenance. I wonder about sliding bypass doors on the island- you could keep the lesser used stuff on one side and then slide the doors to that side while you’re working in the kitchen. The items that you use frequently will be accessible without constantly opening and closing the door. Then while not using items from the island, door are closed and dust is shut out. Although, this way you don’t have the benefit of display- I just love the look of open shelves. 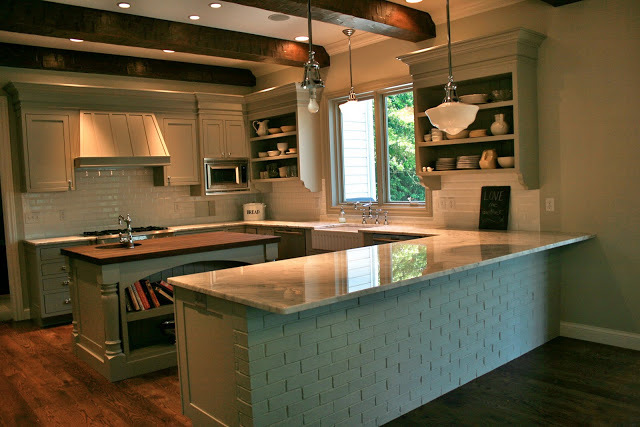 Love your kitchen- those brass fixtures over the island are beautiful. I am in the planning stages of a kitchen redo and am leaning toward opening shelving (upper). My question is if the dishes near the cooktop get greasy/grimy?? Does a really good hood/vent take care of that problem? I love the look but my husband will hate it if everything near the range gets gross. Any thoughts? 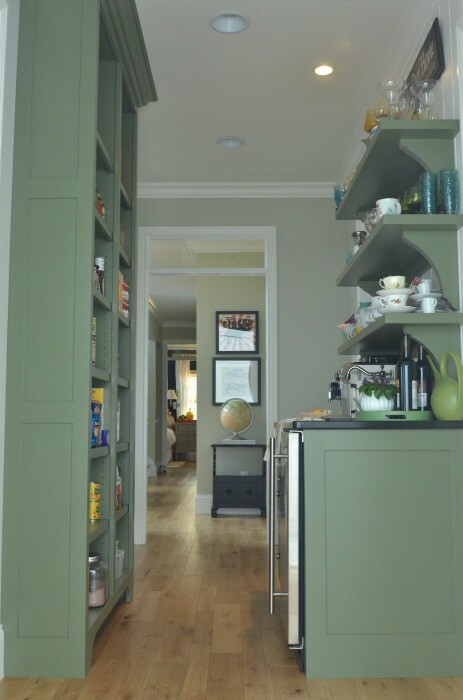 I absolutely love the open-shelving pantry shown in the last photo! I have been looking for just such an example for my husband to see my ideal dream kitchen. Do you have another photo of this pantry facing it? that comes with a credit building element as an alternative. you will not build the chest that you are looking for. build the chest that you are looking for. It’s a good idea to have separate email promotions for prospects and customers, too, because you typically need to send different information to the different groups. You wont get a true imitation of your signature with this Android app, unless you can cleverly manipulate the mechanics behind its operation, but that is highly unlikely. There are a number of benefits associated with form builder just the same way it is the best tool to showcase potential. force. Microsoft Access is more than just a database application. Thanks for the post- I’ve noticed that open shelving seems really popular especially in Better Homes & Gardens but I was questioning the practicality and wanted to see what opinions were out there. Beyond the fact that I personally think it looks cluttered, I also have noticed that the open shelves in my dining room are like dust collectors. I can’t use any of the dishes on them (which are mostly special-purpose things like fancy tea cups without washing them each time, which IMO is super-duper annoying. I can’t wait until one day when I have a home big enough that I can have a china cabinet with glass doors. For my future kitchen in said house, closed cabinets will be the norm! (to be fair- the open shelves in my dining room are freestanding shelves- maybe if they were closed in on the sides, I wouldn’t see as much of a problem with the dust. Open shelves force you to stay organized. This is a good thing! They also enable you to unload the dishwasher way faster, which was a big selling point. I noticed you white dinnerware on the bottom shelves of your island. What kind are they? I’ve been on the lookout for a good durable white and have been reading reviews and wondered what you like? Virgo ascendant is considered as the self-ascendant of Rahu. person by what they wrote on their profile. If I may interrupt this fascinating discussion on open shelving and ask what color are your lovely gray kitchen cabinets and green hutch? Thank you so much! Love, love, love your entire kitchen! fill with cold water. Create a dozen patties, each about a quarter of an inch in thickness. Spot on with this write-up, I really believe this web site needs a great deal more attention. This whole discussion is so interesting. I’m about to install a new kitchen with NYKB and they offer a really clever kitchen design that combines both cabinetry and open shelving. 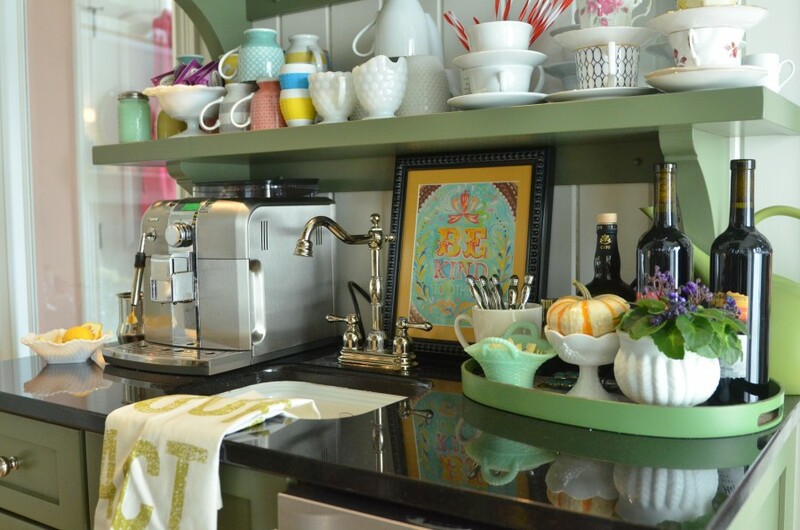 I love the idea of open shelving to display cute trinkets and its really helped me add color to my otherwise earthy kitchen. I selected a lot of neutral beige and beach wood and just needed a splash of color so purchased some basic everyday crockery to display on an open shelf, along with some boxes and a matching kettle and telephone to accessorize. I think its great to have items you’re going to use every day on open shelving, so practical, but I would never manage with the constant up keep of having everything on display and I HATE dust. So its a half half for me! Love your ideas. Have you ever considered using industrial shevling for home decor. Would it be beneficial if anyone use Island gondola racks for her kitchen?